Neil Adams is currently Senior Lecturer in Spatial Planning and Course Director of the BA Urban and Environmental Planning Course. After studying at Cardiff University Neil worked for local authorities in Walsall and Bradford in the field of urban regeneration before moving to Belgium. In Belgium he worked initially as a freelance planner before starting work for a Brussels based consultancy working on projects for Flemish authorities. Between 1999 and 2005 he worked as project leader exclusively on international projects primarily in Central and Eastern Europe in the field of regional development. 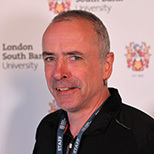 Neil has worked at LSBU since September 2005 during which time he has combined teaching with extensive research and consultancy activities. Research interests include European Spatial Planning, regional and rural development, the territorial cohesion agenda, processes of Europeanisation and the interplay between knowledge and policy development. Alongside research activities in relation to EU funded programmes such as ESPON, Neil has developed extensive experience in recent years providing consultancy for organisations such as the World Bank in the field of regional development and spatial planning. This work has involved assisting with the preparation and the assessment of development strategies for various national and regional bodies primarily in Central and Eastern Europe. Neil has published two edited books, contributed chapters to various books, authored several articles for academic journals and presents papers regularly at international conferences.